It’s Spring and time to pull out the short sleeves! It’s also a great time of year to re-work your closet and turn it around! What do I mean by that? One great tip to evaluating your clothing is to give yourself a visual clue. 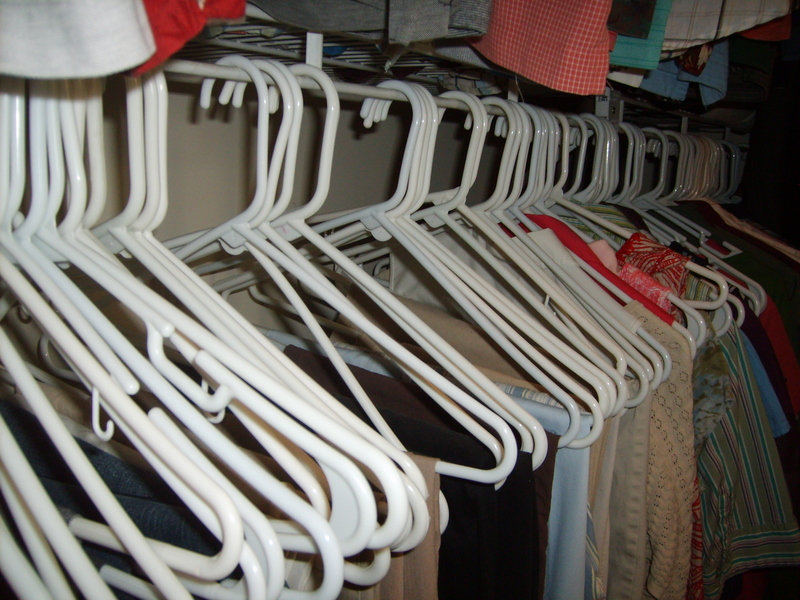 When the seasons change, turn the hangers in your closet around. All of them! 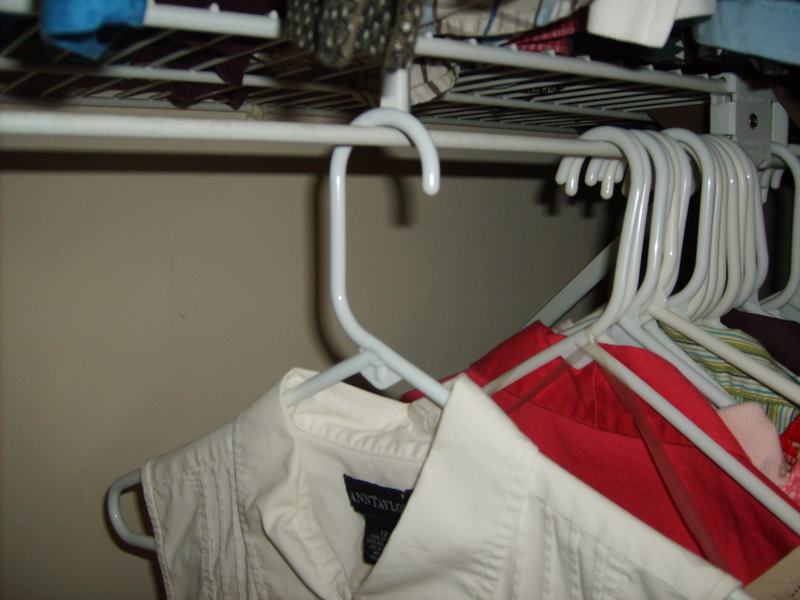 Then as you pull out pieces to wear and then re-hang after you have worn them, hang them back up in the usually method. Here, I’ll give you an example. You know what they say – people use 20% of their items 80% of the time. If this is true for you and your clothing, you have a lot of stuff hanging in your closet that hasn’t seen the light of day in a long time. These pieces will identify themselves to you as time goes on by still sitting on a hanger that is turned around. I do this exercise every Spring and Fall. It keeps me honest. I did it this morning, in about 5 minutes in my entire closet. Some times it will make me wear something that is still “turned” so that I won’t get rid of it. It really does make you think and not mindless keep things that you do not use. 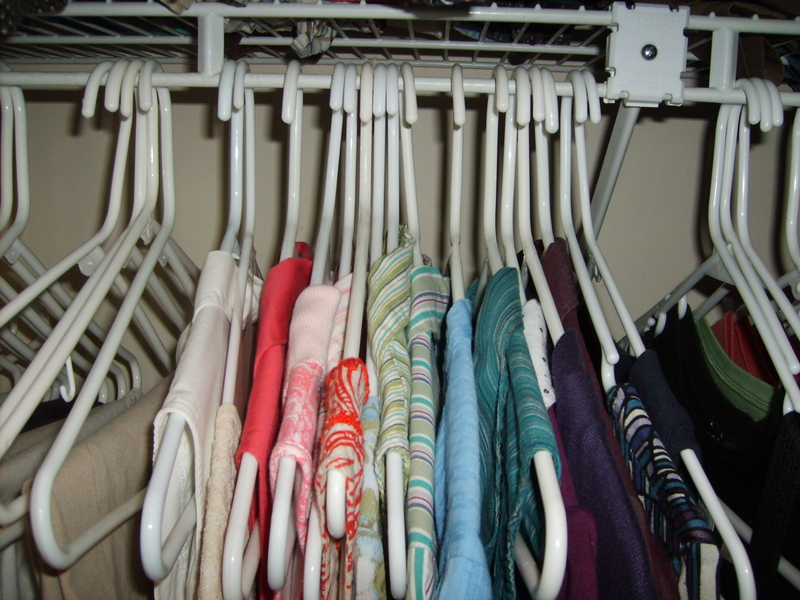 I arrange my clothing by type (short sleeves, long sleeves, pants, skirts, etc.) and then by color. So it’s easy to grab all the same type and just swing them around to re-hang. 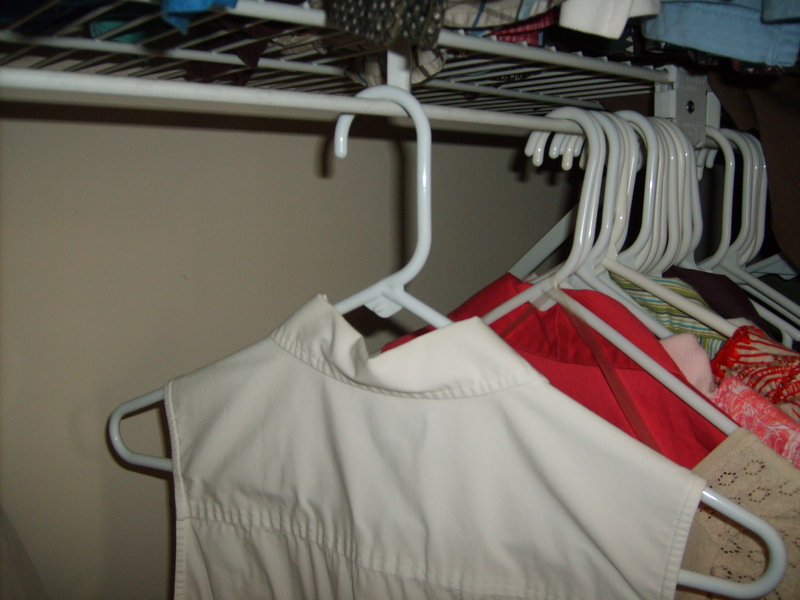 This last photo is of the rest of my closet – jackets, skirts, dresses. I just wanted full disclosure and show you my whole closet (my portion, not my husbands, who I share the space with). This exercise took my only 5 minutes. Now I’ll work with it for the next few months. 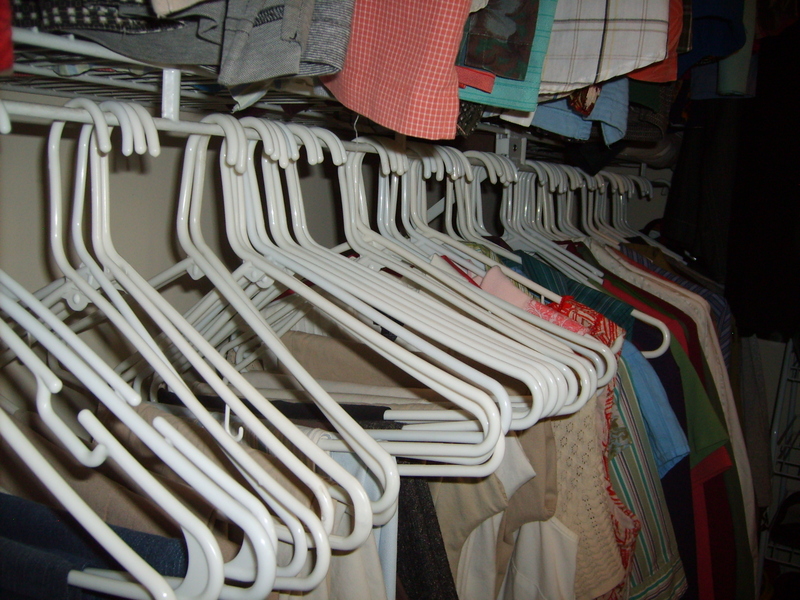 When the seasons change again, I’ll look for hangers that have not been “turned” and evaluate whether each item should continue to hang in my closet and take up space. I see it this way, if I haven’t worn that floral print skirt all summer, what’s the chance that I’ll wear it next summer, all the while taking up my valuable closet real estate? What do you think? 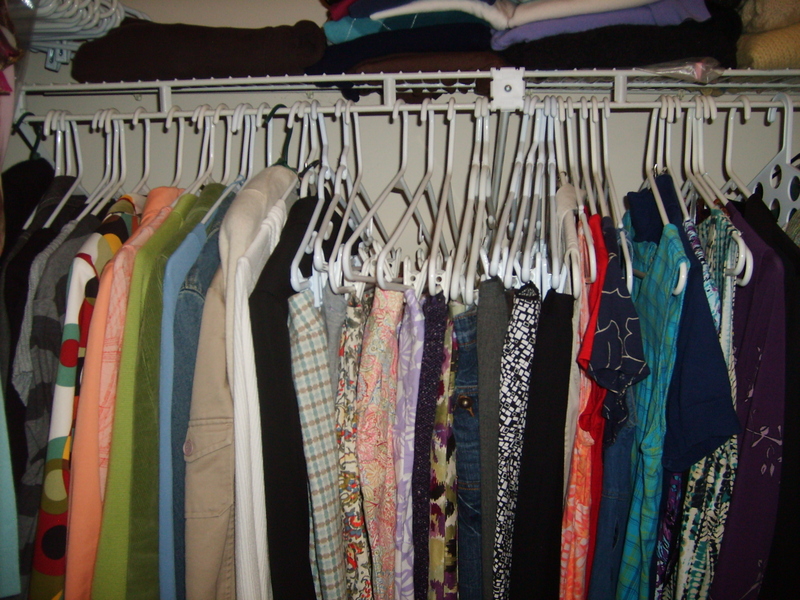 This entry was posted in Residential Organizing and tagged Closet, Closet Makeover, Closet Organizing, Clothes, DIY, DIY organizing. Bookmark the permalink.